Borrowers must apply for a home loan with a lender such as a bank or credit union. Lenders require borrowers to provide proof of income to demonstrate that their income level allows them to comfortably afford the loan. Borrowers must also allow the lender to evaluate their credit history. 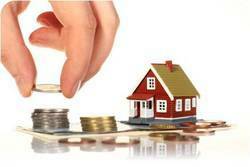 This lets the lender determine how likely the individual is to make his mortgage payments in a timely manner. Mortgage loans carry an interest rate. This interest rate may be fixed and unchanging or variable and subject to change, depending on the type of loan program the borrower selects. The lower the interest rate, the less the individual pays over time for the privilege of the home loan.